A tough year for U.S. retailers entered a critical stretch when Black Friday kicked off the holiday shopping season. On one hand, economic conditions are good. Unemployment is the lowest in 17 years, and credit is easily available. And shoppers are expected to spend more than ever before -- an average of $967 each, according to the National Retail Federation, up 3% from last year. But for the first time more of those shoppers say they plan to shop online than in big box stores like Walmart or Target. The big jump in spending Thursday and Friday came from online shopping, according to Adobe Analytics. Online sales hit $2.9 billion on Thanksgiving day, and $640 million on Black Friday as of 10 a.m. ET. Both figures are up 18% compared to a year ago. The shift to online shopping has been a steady trend for two decades, but the impact on malls and other physical stores has been particularly brutal this year. Store closings have more than tripled to a record 6,700, according to Fung Global Retail and Technology, a retail think tank. And retailers large and small have filed for bankruptcy, including prominent names such as Toys R Us, Gymboree, Payless Shoes and RadioShack. Retail experts say the shift in shoppers' preference to online makes this holiday shopping season particularly crucial for troubled stores, despite the outlook for spending. Even with the growth of online shopping, online purchases only made up about 17% of holiday purchases last year said Miro Copic, professor of marketing at San Diego State University. This year he predicts that could top 20%. It might not seem like a big change, but that could have a major impact on some brick-and-mortar locations and chains. "The growth of online certainly impacts already thin margins of brick-and-mortar retailers," said Copic. "For a lot of companies, this holiday season is make-or-break." 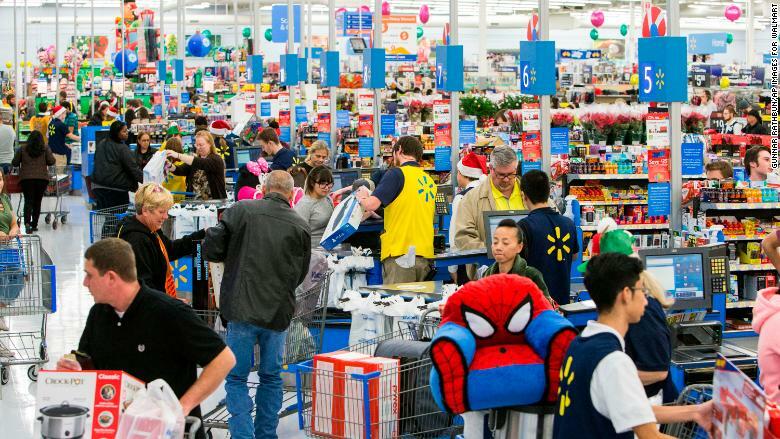 Still, Friday is expected to be the busiest day of the year for brick-and-mortar stores. Saturday is expected to be the fifth busiest day, according to ShopperTrak, which measures foot traffic in stores. 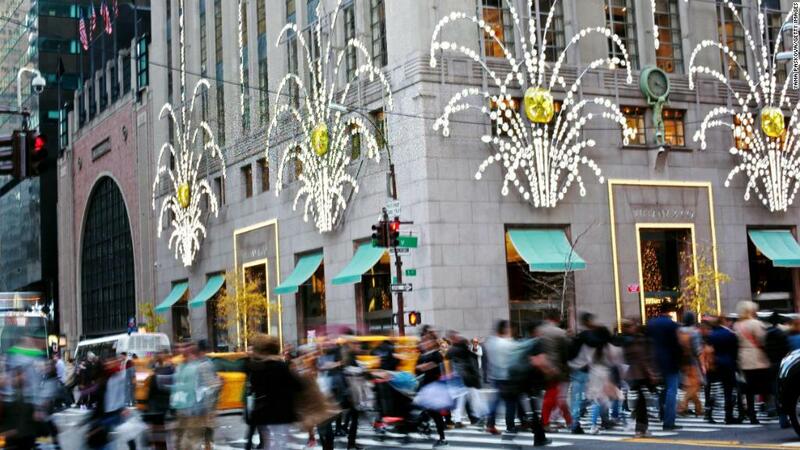 "The Thanksgiving Day weekend will be a critical span of days for retailers as they head into the holiday season," said Brian Field, senior director of advisory services at ShopperTrak. And there were decent crowds out at some malls early Friday. "Traffic has been pretty good here," said Rod Sides, the head of the retail practice at Deloitte, who was visiting malls in Winston-Salem, N.C. "I didn't see crazy lines, but I think brick-and-mortar will do fine this weekend. There's enough in-store-only offers out there to bring people out." Related: Is this the last Black Friday for some troubled retailers? There were long lines early Friday outside a Best Buy in Westbury, Long Island, as shoppers waited for deals on hot electronics such as televisions. Moses Castillo, 20, had been waiting on the Best Buy line since 5:30 a.m. for the store's 8 a.m. opening, hoping to grab a 4K Ultra HDTV. He had been at the same store the night before with some family members but the television he wanted wasn't on sale then. "Yesterday there was a 50-inch TV for $180. People were like hawks taking them off the shelves," he said. "When you buy online, you don't have to wait out in the cold, like us. But the deals aren't as good." But crowds were mostly missing at the Walmart in the same mall. Chris John, 63, from Mineola, eyed some of the electronics on sale there, but he didn't even have a cart and didn't anticipate making a purchase. "I used to come here when it was really Black Friday," he said, remembering when people were trampled in the rush to buy. "Now, most people can take advantage of free shipping." There were decent crowds at a Sears in Flatbush, Brooklyn, but it wasn't jammed. "I expected it to be more crowded than it is," said shopper Dionne Granger. "You hear about Black Friday and you expect it to be more crazy." Some shoppers admitted they were hitting the stores rather than the internet just for the experience and the tradition. Melissa Salmanowitz describes herself as a loyal Amazon shopper but said she was out shopping starting at 6:30 a.m. Friday at a Bed, Bath and Beyond in Washington, D.C. She planned to hit multiple shopping districts. Retiree David Jackson left Target in Washington by 7 a.m. Friday with a gift he wanted for his wife's upcoming birthday. He didn't want to risk delivery of an online purchase. But he said more often than not when he goes to stores it's to look at the item in person and then he'll shop for the best deals online. In midtown Manhattan there were almost no shoppers at a Toys "R" Us Express which had been open since Thursday afternoon. A store employee said that just two to three customers per hour had visited the store since midnight. Christina Souffrent and Nieame Harper had been shopping since 5 a.m., hitting nearby Macy's, Old Navy, and Victoria's Secret before taking a break at a nearby mall. But they had relatively little to show for their shopping, saying they were disappointed at the prices. But Kgore Knoty was having a better day. She started shopping around 11 p.m. Thursday and had a cart overflowing with purchases. "I'm very tired," she laughed. "I don't know why I'm still here. It's a sickness."